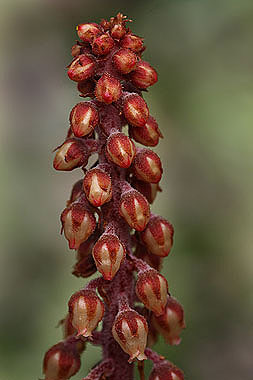 Woodland Pinedrops grows in decaying organic matter on the floor of pine forests. The plants have no chlorophyll, and derive their energy from associations with mycorrhizal fungi. It is believed the fungi may form a "bridge" between the Pinedrops and roots of pine trees, allowing the Pinedrops to acquire energy through an indirect parasitic relationship. Other sources describe the plant as a saprophyte, associating with fungi to derive energy from decomposing organic matter. 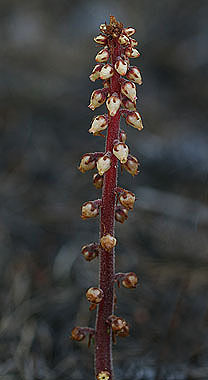 Woodland Pinedrops can grow as tall as 3 feet. Dead stalks are persistent and can be found throughout the year.